With 'Paper Towns,' Author John Green Reopens Search For Agloe, N.Y. Agloe, N.Y., is not a town in any real sense. Instead, it's among a number of fakes that mapmakers planted to foil plagiarists. It inspired John Green to write his book (and now movie) Paper Towns. Agloe, N.Y., is a fictitious town created by cartographers to catch those who might copy their work. This sign stands where the coordinates appear on the map. Agloe, N.Y., is a place suspended between fiction and reality. The town started showing up on maps in the 1930s, but it's actually a "paper town," or a fake town created by cartographers to catch those who might copy their work. Mapmakers Otto G. Lindberg and Ernest Alpers came up with the name by rearranging their initials. They plotted their creation "at the intersection of two dirt roads in the Catskill Mountains," says John Green, author of the novel, Paper Towns, which features a journey to the elusive village. The film adaptation of his novel recently hit theaters. But the story Agloe didn't end with a dot on a map. A few years after Lindberg and Alpers set their map trap, the fake town appeared on a Rand McNally map, prompting the two mapmakers to sue for copyright infringement. "Rand McNally said, 'no, no, no, no, no — that place is real!' " Green says. 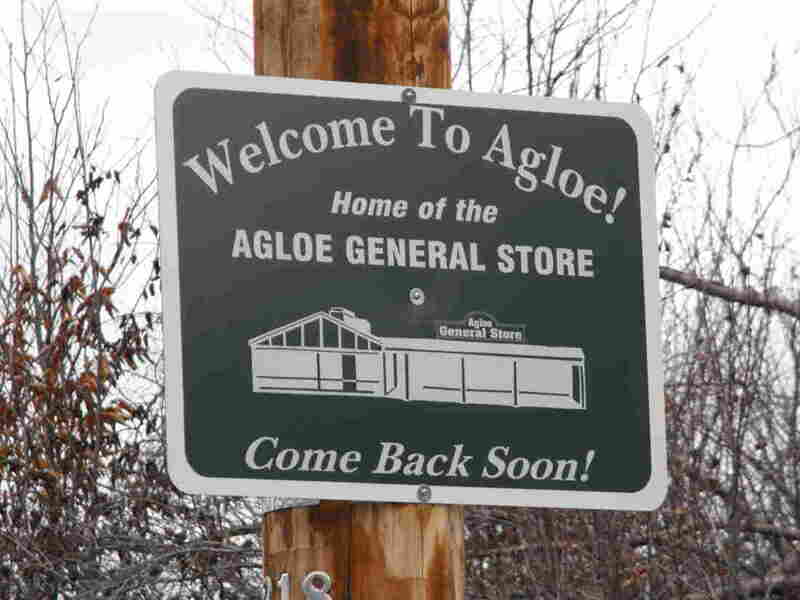 "Because people kept going to this intersection of two dirt roads in the middle of nowhere, expecting there to be a place called Agloe, someone built a place called Agloe. There was an Agloe general store and two houses." The fake town had become real, until the store eventually closed. Decades went by, and Agloe still showed up on paper maps. When Green followed those maps while researching his book, all he found was a field and a barn where Agloe was supposed to be. After Paper Towns was published, fans of Green's novel attempted their own pilgrimages to Agloe. They, too, just found the field and the barn, and some of them would leave copies of his book there. "The strangest part of it to me is that this place that was imagined, and then real, and then disappeared, and then imagined again through my story — has kind of, in a way, become real again," Green says. "Because people have started to go there again and to associate that field and that barn with the idea of Agloe. And that's certainly something that I never, ever imagined when I was writing the book." Now that the book has become a movie, that field and barn could get more than a few visitors. Though originally fictional and now long-gone, the town and its general store still show up on Google maps.